For the first time in surveys dating to 1992, majorities in both parties express not just unfavorable but very unfavorable views of the other party. And today, sizable shares of both Democrats and Republicans say the other party stirs feelings of not just frustration, but fear and anger. More than half of Democrats (55%) say the Republican Party makes them “afraid,” while 49% of Republicans say the same about the Democratic Party. Among those highly engaged in politics – those who say they vote regularly and either volunteer for or donate to campaigns – fully 70% of Democrats and 62% of Republicans say they are afraid of the other party. Across a number of realms, negative feelings about the opposing party are as powerful – and in many cases more powerful – as are positive feelings about one’s own party. While partisans generally agree with their party’s policy positions at least most of the time, just 16% of Republicans and 20% of Democrats say they “almost always” agree with their party’s policy stances. By contrast, more than twice as many Republicans and Democrats (44% each) say they “almost never” agree with the other party’s positions. These sentiments are not just limited to views of the parties and their policy proposals; they have a personal element as well. Asked to rate several groups on a 0-100 “thermometer” – where 0 is the coldest, most negative rating and 100 represents the warmest, most positive rating – Republicans and Democrats give very low ratings to the people in the opposing party. 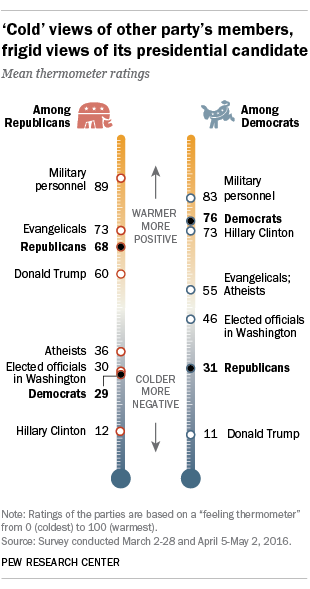 Democrats give Republicans a mean rating of 31 – far lower than the average ratings for five other groups on the thermometer, including military personnel and elected officials. Republicans give Democrats a mean rating of 29; only elected officials (30) and atheists (36) are nearly as low. Clinton gets an average rating of 12 among Republicans. Among the 76% of Republicans who give Clinton a very cold rating, 59% rate her at zero. These are among the principal findings of Pew Research Center’s study of partisanship and political animosity, conducted among 4,385 adults from March 2-28 and April 5-May 2 on the Center’s nationally representative American Trends Panel. This report was made possible by The Pew Charitable Trusts, which received support for the survey from The William and Flora Hewlett Foundation. The surveys were conducted before Trump and Clinton became their parties’ presumptive presidential nominees. For Democrats, no single critique resonates more than the notion that Republicans are closed-minded. Fully 70% of Democrats say that Republicans are more closed-minded than other Americans. And nearly as many Democrats (67%) say the people in their party are more open-minded than other Americans. Fewer Democrats (42%) say Republicans are more dishonest than other Americans, 35% say they are more immoral and 33% say they are more unintelligent. Many Republicans, by contrast, think Democrats fall short on several traits. 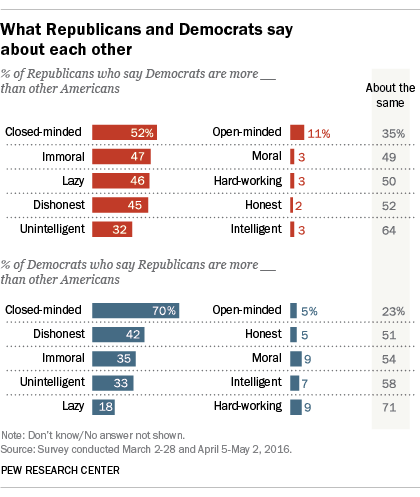 While more than half of Republicans (52%) view Democrats as more closed-minded than other Americans, nearly as many say Democrats are more immoral (47%), lazier (46%) and more dishonest (45%). Not only do almost half of Republicans say Democrats are lazier than other Americans, most (59%) also say the members of their own party are more hard-working. And about half of Republicans (51%) view Republicans as more moral than other Americans. Despite these widespread partisan stereotypes, most Democrats and Republicans stop short of saying that it would be more difficult to get along with a new community member who belonged to the other party. About three-in-ten Democrats (31%) and 27% of Republicans say it would be harder to get along with a new person in their community if they belonged to the other party. On the other hand, somewhat greater shares of Democrats (42%) and Republicans (43%) say it would be easier to get along with a new neighbor who belongs to their own party. While the current partisan environment does not for the most part appear to be turning neighbor against neighbor, it may be making for some difficult conversations about politics. 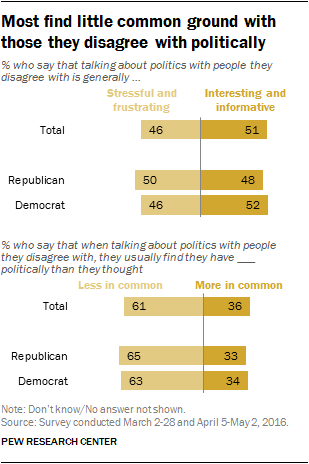 And majorities in both parties (65% of Republicans, 63% of Democrats) say that when they talk to people on the other side, they usually end up finding they have less in common politically than they thought. Our study of polarization in 2014 found that a major element of partisan polarization “has been the growing contempt that many Republicans and Democrats have for the opposing party.” Since then, levels of mutual contempt have grown, and “many” has become “most,” according to a separate survey of 2,008 adults, conducted on landlines and cellphones from April 12-19, 2016. Today, 58% of Republicans have a very unfavorable impression of the Democratic Party, up from 46% in 2014 and just 32% during the 2008 election year. Among Democrats, highly negative views of the GOP have followed a similar trajectory – from 37% in 2008 to 43% in 2014 and 55% currently. Over the past two years, as the numbers of Republicans and Democrats with very unfavorable views of the opposing party have grown, so too have the shares saying the other party threatens the nation’s well-being: 45% of Republicans now view Democratic policies as a threat, up from 37% in 2014. And 41% of Democrats say the same about the Republican Party’s policies, an increase of 10 percentage points from two years ago. The power of negative feeling toward the opposition is reflected in the reasons people give for identifying with their own party. 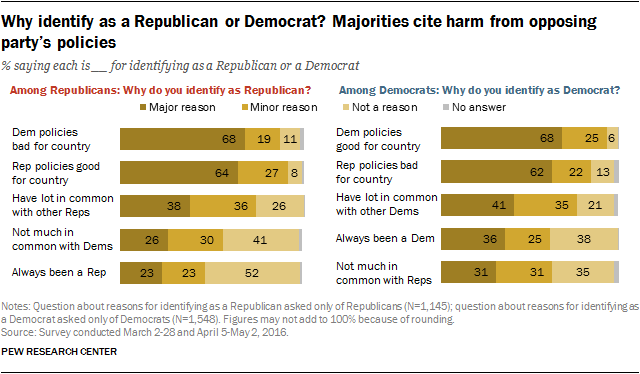 Majorities in both parties point to the positive impact of their own party’s policies as a major reason for their choice of parties – but nearly as many cite the harm caused by the opposing party’s policies. And independents, who now outnumber both Republicans and Democrats and overwhelmingly “lean” to one party or the other, are far more likely to cite negative than positive factors for why they form their loose partisan ties. More Democrats cite the positive effects of their party’s policies than the negative consequences of GOP policies, but the margin is modest: 68% say a major reason they are a Democrat is that the Democratic Party’s policies are beneficial for the country, while 62% say a major reason is because Republican policies harm the country. Other reasons for identifying with a party, such as having a lot in common with its members or having long-standing ties with a party, are cited far less frequently as major factors for choosing to identify with a party. For independents, by contrast, negative motives are cited most frequently among the reasons for leaning toward a party. Among Republican-leaning independents, 55% say a major reason for leaning toward the GOP is that Democratic policies are harmful to the country. Just 30% cite the positive effects of Republican policies. 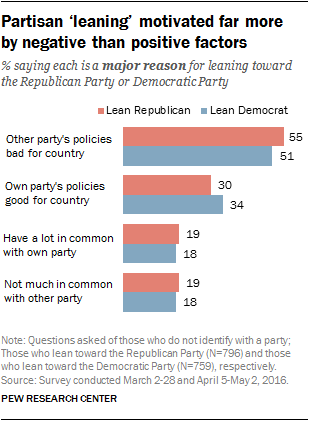 For Democratic leaners, far more also point to the negative consequences of the other party’s policies (51%) rather than the positive effects of their own party’s policies (34%) as a reason to associate, however loosely, with their own party. Having a friend from the other party matters, especially for Republicans. In both parties, those who have few or no friends in the other party are more likely to have “very cold” feelings about the people in that party. This is especially the case for Republicans: Those with few or no Democratic friends are twice as likely to rate Democrats very coldly than are Republicans with at least some Democratic friends (62% vs. 30%). Most Republicans and Democrats want compromise on their terms. Majorities of Democrats (62%) and Republicans (58%) say their party should get more of what it wants on the key issues facing the nation. Partisans with colder feelings toward the other party are even more likely to say their own side should get more of what it wants. Four-in-ten Republicans give Michelle Obama a zero. Republicans feel very negatively toward Barack Obama, but a majority also gives “very cold” thermometer ratings to Michelle Obama. Fully 81% of Republicans feel very coldly toward Barack Obama, including 59% who give him a zero on the 0-100 scale. Nearly six-in-ten Republicans (59%) give very cold ratings to Michelle Obama; 40% of Republicans give her a zero. Parties and issues. Majorities of Republicans and Democrats say they agree with their parties’ positions on nine issues tested. However, “strong” agreement varies widely by issue: Republicans are more likely to strongly agree with the GOP’s position on illegal immigration and gun policy, while Democrats are most likely to strongly agree with Democratic positions on health care, abortion and climate change.